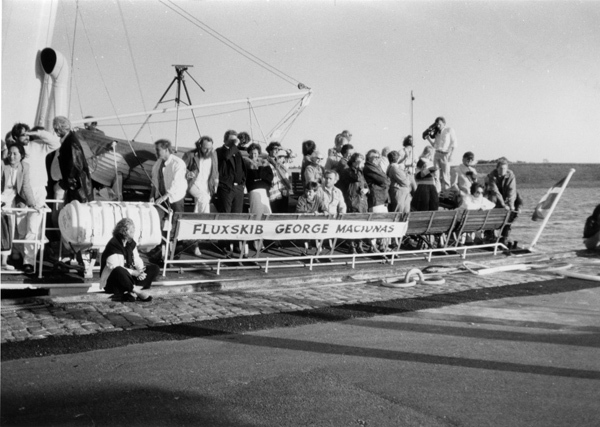 Onboard the ship Skjelskør, which for the occasion had been re-named FLUXSKIB GEORGE MACIUNAS, Eric Andersen greeted the audience. 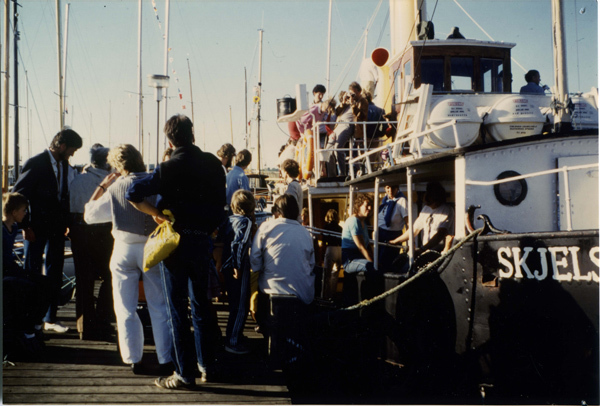 Leaving Roskilde Harbour, Andersen elaborated on the purpose of the trip: only the captain knew where they were headed, but within 30 minutes the ship would reach its destination and Geoffrey Hendricks would do a performance. On the way there, Flux food by Robert Watts was served in the gallery below, and Philip Corner performed small events on the deck. After arriving at the Risø peninsula, Geoffrey Hendricks began his performance. 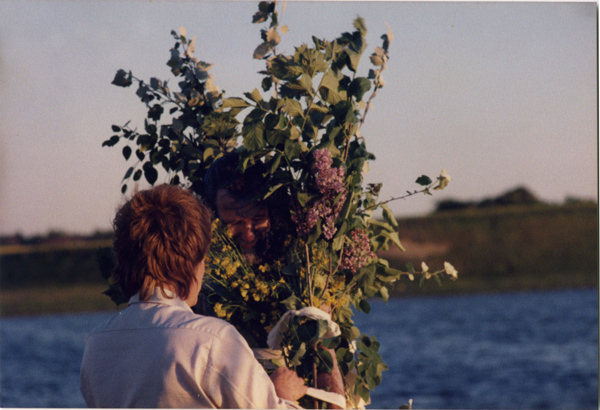 The performance consisted of a number of ritualised actions which saw Geoffrey Hendricks cleansed by means of sea water, sand, coloured chalk powders and blue spray paint and then dressed in branches and flowers. 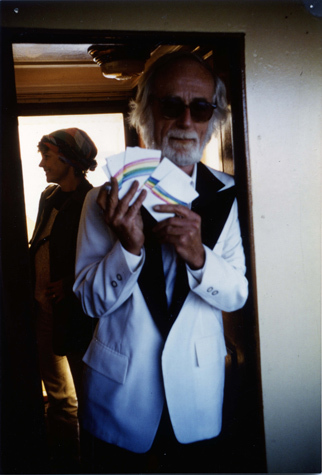 While Eric Andersen and Robert Watts assisted Geoffrey Hendricks, Philip Corner again engaged in events, slowly sawing a chair in two. This proved to be rather difficult and surprisingly noisy; however Philip Corner eventually succeeded. Wrapped in branches and smeared in colours, Geoffrey Hendricks returned to the ship where he was tied to the mast. Sailing back to Roskilde Harbour, the ship was bathed in a low afternoon sun and a full moon had appeared on the sky. As Geoffrey Hendricks disembarked the ship, the audience applauded and he walked back to the city centre, still dressed as nature’s son. 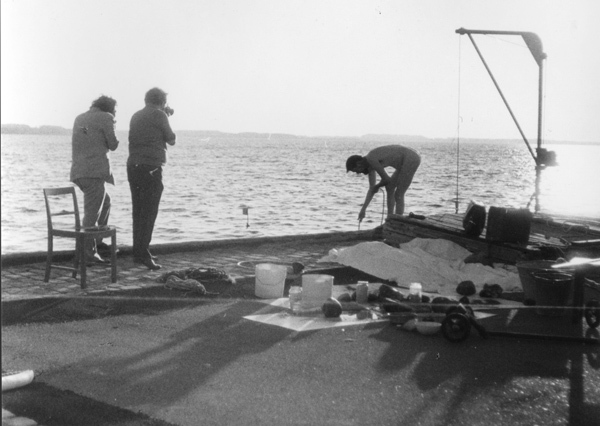 A Fluxus meal was served in the little dining room of the ship Skjelskør. The meal was served in three sittings. All passengers were handed black, white or red cards which decided the colour of the food they were served. Towards the end of the trip, a pastry replica of the boat was served as dessert. -Arild Batzer: Art makes me sad – from radio reporters’ dairy. Finally Geoff was tied to the mast of the boat and he travelled home in the glorious sunshine and strong wind like a viking martyr, as a full moon rose over the homeward path and black smoke billowed from the funnel. Near port we were served pieces of a huge cake in the shape of the boat itself. - Henry Martin, “Festival of Fantastics” in “EAR Magazin of New Music”, p. 16. New York, November/December 1985. Discovering the ship Skjelskør – København - the piece comes into focus, it is the perfect boat for the trip. With pictures of the old King and Queen in the dining area, it has the feeling of an earlier time. The journey is the performance. I meet the Captain, Niels Borserup, and am shown around the ship. It will hold up to 100 passengers and 24 may eat at one time. We must serve Flux food. The hold could be used for supplies, but also as an entrance, and the fore cabin has two bunks. There is a toilet and small washbasin that could be for a flux-event. The upper deck is open. The lower deck is covered. It has a whistle, boiler room and coal fired engine. There is the captain and a crew of two. It has no galley/kitchen so all the food must be prepared before. We must plan different meals and different servings. Should there be one seating each way, or can we have two so that everyone has a chance to try some Flux food? That’s me sitting on the wooden chair and sawing it in half—one of Geoff’s signature gestures. The two halves are to be tied together afterward, but in reversed order. Noone could sit on it then, so that makes it art. Geoff left to me to do the tying, with, as i remember, flexible branches and it was not very easy. Nor very successful.. I saw what a real artist can do with vines and knots in the gallery next day, where Geoff had redone all my work.